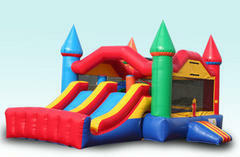 A 6n1 Dual Lane Combo Bounce House! One of a kind you saw it here first. This bounce house rental boasts an inflatable safety ramp, a bounce area, a couple obstacle pop ups, an inflatable crawl through tunnel and two, that's right two slide lanes. This bounce house rental is multicolored and perfect for boys or girls. In the summer time you can rent this bounce house wet and add a pool instead of a bumper. This bounce house also has mesh netting that allows the breeze to move through the unit and a shade screen above the bounce area. Check out our wet verizon by Clicking here to reserve the Wet Version.